In late 2008 I did some scouting of locations near Denver International Airport, and in December headed out to one of those locations with a photographer friend. Parked on the side of the road we watched the aircraft depart after dusk on a mild evening. 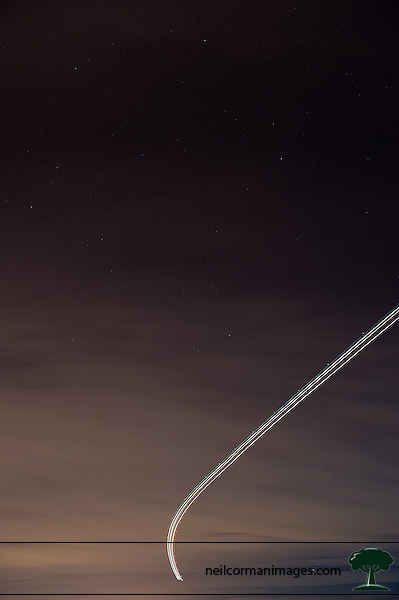 As the aircraft took off we photographed trying to catch the lights of the plane go through the night. One of the issues is that after sunset most of the aircraft depart to the west. Where we were located if the aircraft would take off on the south runway, it would usually turn to the west prior to reaching our location. After some time, I was getting ready to give up when an aircraft started a turn to what it looked like could be to the southeast and near our position. Quickly adjusting the camera, I open the shutter and started counting the number of seconds. I wasn’t sure when the aircraft would be out of the frame, but once it was even with me I knew that was more than enough. With the 45 second exposure the light from the airport illuminates the bottom of the clouds which were present in the distance. Also at that length of exposure you start to get slight movement from the visible stars. The amount of movement of the stars depends on their distance from the north star. I wasn’t sure at that time if this image would be the one I was hoping to obtain, but once I got home I knew this would be a keeper of an Aircraft Departing. Be a safe distance from the airport as there are many security concerns these days. A safe distance may help with some of those matters, but do be smart about your location. Respect private property. If there is a fence don’t jump it or sneak through an opening. If you would really like to access some property in order to photograph especially in a farm area inquire ahead of time and be honest with what you are looking to do. Be a safe distance off the road. For this photograph we were not near a busy road, but one with a high speed limit. Make sure that you are well off the road with your car and self. Additionally don’t position yourself just over a hill as drivers will not see you until they are close. If you can, use the car to also protect you from oncoming traffic as well as light pollution. Normally I will be parked on the shoulder and photographing further down so I am not next to the car, however in a location where it can help shield me if needed. Also know the law for area and if a reflective vest is needed where you are photographing. Dress for the time of year. After a while it may start to get chilly being in one location. Have additional layers of clothes available to add if needed or be ready to call it an evening if you are not prepared for the weather. Have you photographed anything with paints a line in the night, or know of anything else to try with a long exposure?